Historical fiction, WWII era, frontier nurses. Check, check, check. 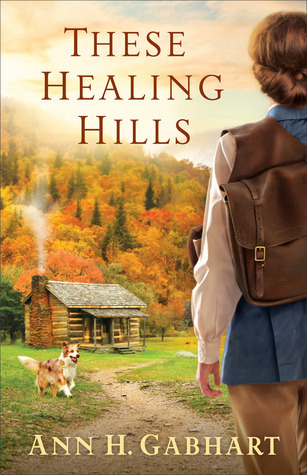 I knew with all of these elements, the odds of my enjoying These Healing Hills by Ann Gabhart was fairly high. What I didn't realize is what a gem I'd find in this new to me author and the Appalachian Mountains she wove into life. One review on the back cover calls this a "beautifully crafted story" and that is a wonderful description of what Gabhart has achieved. Gabhart has used her research to invite readers into a small section of mountain life in 1945. As anyone who's poked around here before knows, I need a good character to connect with a story and Gabhart provides a mountain full. The Locke family are real, I love how Gabhart has captured the dynamics of life on the mountain among such a diverse family of characters who are relearning how to be in the same space after so many changes. Equally captivating is Francine, our intrepid nurse. Again, I really came to appreciate Gabhart's attention to detail in her characters. Fran's wrestling with her insecurities were well established and her confusion about how to proceed in life feels relatable. Oh, and can we talk about the amazing Granny Em? What a character, I love how Gabhart showed the transition of eras with Granny Em's wisdom and knowledge of the old ways. Honestly, I would be crushed if this book found a sequel without Granny Em's ever present wisdom. Stylistically, I found Gabhart to have a blend that was quick to draw me in as a reader and hold my attention. Using actual historical records to base her frontier nurses on lent interest and credibility for the geek in me, but the earnestness with which she conveyed the humour, hardworking nature, and love of the mountains inherent to her characters lent a richness to the novel that made me wish I was doing rounds with Fran (although I can guarantee we'd still need Ben or Woody to rescue us from our own sense of direction). Fans of historical fiction will probably not find any major surprises in the overall plotlines, whether it's Fran's coming into her own, Ben's readjustment to life post-war, or Woody's brink of manhood adventures and yet the charm of this book and it's characters draws me like the mountains draw in Fran.